Kate West is an Emmy-nominated television journalist with 15 years of experience covering the news for various television stations across the country. Currently, she’s the morning reporter for the Emmy award-winning KXAN News Today. Since 2004, Kate has set her alarm clock for 2 a.m. to wake up Austinites. Before coming to the Live Music Capital, Kate worked at the ABC affiliate in Harrisburg, Pennsylvania, the CBS affiliate in Roanoke, Virginia, and the CBS affiliate in Clarksburg, West Virginia. She graduated with a bachelor’s in communication from the University of Massachusetts in 1998 and earned both her master’s and Ph.D. in journalism from The University of Texas at Austin in 2008 and 2012, respectively. Kate left Austin for one year to become an assistant professor at the University of Georgia in the Department of Telecommunications. 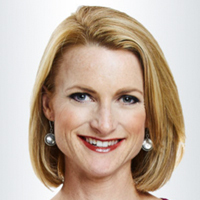 Kate has received two Emmy nominations for her reporting and has been recognized by the Texas Associated Press for being a part of the 2010 and 2013 winning team for Best Morning Newscast as well as a Texas Associated Press Award, First Place, Spot News Story Individual, 2013. Kate’s research looks at the convergence of media organizations and the sharing of content between competing organizations. Her research has appeared in peer-reviewed journals like New Media & Society and the Journal of Broadcasting and Electronic Media. Kate has also been the recipient of the University of Texas McCombs Publishing Award and has had numerous papers presented at AEJMC and ICA conferences. Kate and her husband have two young and energetic kids, an 80 pound lab mix that never tires out, and two cats. You’ll often find Kate running on the Hike and Bike Trail in her spare time.